Twin Honda BF250 engines in action; Inset: Honda Airflow Diagram. 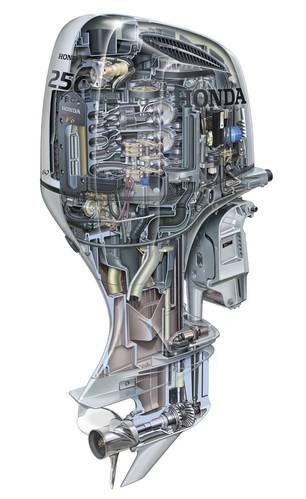 Innovative four stroke engine is Honda’s most powerful and now its flagship entry in the crowded outboard propulsion markets. 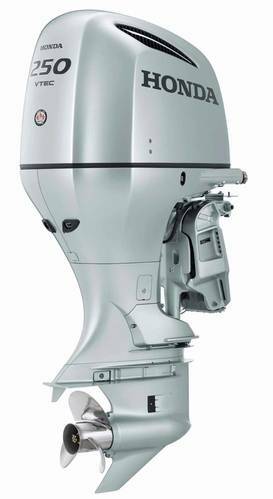 The new BF250 horsepower (hp) four-stroke engine, the most powerful outboard ever to join the Honda Marine lineup, is also the company’s flagship model. Incorporating a number of advanced technological innovations that contribute to the engine’s high fuel economy and superior performance, the 3.6-liter engine is additionally equipped with an all-new gear case, the world’s first marine direct air dual circuit induction system of its type (providing for cooler, denser air for better combustion than conventional under-cowl induction systems) and has a full-throttle rpm range of 5,300-6,300. Steve Drenkard, assistant manager, marketing, Honda Marine, wouldn’t discuss specific sales data but he told MarineNews in April that since its October 2011 introduction, “The BF250 had sold well and has been a great new power option for customers globally.” And, although Honda is perhaps best known for its marine products in the pleasure niche, the B250 is robust enough to stand the test of a commercial operation. Drenkard added, “The BF250 is most certainly versatile for both commercial and recreational applications, and we have enjoyed success in both segments with the new outboard. We do have a strong history of providing our outboards for military applications such as the U.S. Coast Guard’s Homeland Security initiative, so we will continue to maintain our relationships within the market. That being said, Honda Marine strongly values our recreational customer and always works to provide the best boating experience we can to those customers – through low cost of ownership, great performance and ease of operation.” Arguably, those three metrics transcend all lines of business. BLAST, or Boosted Low Speed Torque, uses a unique Honda spark advance system to provide more horsepower when it is needed most. When the throttle is advanced quickly, BLAST activates to open up the throttle body, change the air-fuel ratio to a richer setting and aggressively advance the ignition timing. According to Honda, this allows the engine to produce more torque to improve acceleration (hole shot) at low speeds. For law enforcement, military and patrol operations, the combination of VTEC and BLAST, therefore, represents an enormous advantage. All Honda outboards boast environmental performance that includes meeting the rigorous California CARB Three-Star Standard. The Three-Star label identifies engines as Ultra Low Emission if they meet CARB’s 2008 exhaust emission standards. Engines meeting this standard produce 65 percent fewer emissions than One Star (Low Emission) engines. Along with that – and just as important – the new Honda Marine BF250 outboard engine produces enviable best fuel economy. According to Steve Drenkard, Lean Burn Control is the key. Automatically adjusting the air/fuel mix according to speed and load while maximizing power throughout the acceleration range – providing as much as 20 percent greater fuel economy in cruise mode (2,000 to 4,500 rpm) – Lean Burn Control has been enhanced to improve fuel efficiency even further in specific cruising ranges, resulting in best-in-class fuel economy – as much as 30 percent better than competitive models, depending on specific running conditions. The air/fuel ratio control is performed by the Electronic Control Unit (ECU), based on the feedback from the O2 sensor, allowing more accurate control in the lean-burn range. Finally, the gear case of the BF250 engine incorporates an advanced design that minimizes water resistance, and by extension, reduces the overall drag coefficient by five percent (even without the use of the larger, optional propeller). Because the BF250 engine mounts on industry-standard 26” centers, repowering twin BF250s is convenient. Having a 26” industry-standard engine mount is an advantage in several ways. In terms of repowering, older boats traditionally utilized the standard 26” distance, making it an easy fit to repower with Honda engines that utilize the same standard. By extension, having to modify a transom to accommodate a different distance is costly. Having ample room between the two outboards allows for easier access for maintenance, and this distance provides tighter turning capability. If the B250 engine is any indication of what is to come next, then Honda’s role as a force in the workboat markets is anything but at full throttle. And, that’s because this engine manufacturer, known best as a pleasure market product provider, has arrived on the commercial and military waterfronts. Indeed, it has been there all along.